Race Night at the Boulder Velodrome! 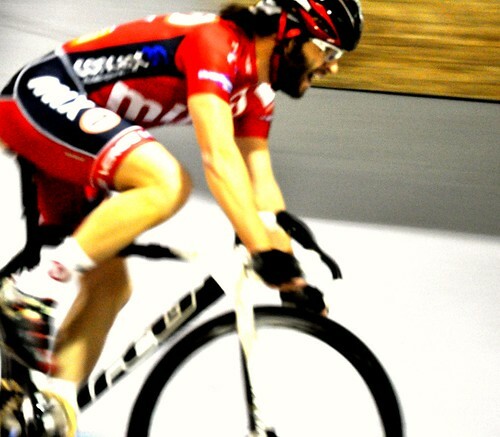 Last night was the first night of racing at the Boulder Indoor Cycling Velodrome! I'm happy to say, there was no carnage and the racing was pretty cool to watch. There was a scratch race, a snowball and a team pursuit. The racing was roughly from 8 to 9:30PM and the elevated viewing area at the Velodrome provided a decent perspective to the racing. The beers (brought by the spectators...BIC does not sell beer) was flowing and spirits were high. I snapped some photos and a crappy video (below) for you to get a sense of the action. Enjoy! Boulder Indoor Cycling Velodrome -First Night of Racing! from Gregory Keller on Vimeo.